Art Works open every day until Christmas for your last-minute shopping! (or just yourself!) an art class. If you are a current Berkeley Arts Council member, you should have received your 2016 membership renewal along with the Call for Artists for the 2016 BAC Members’ Exhibit in January, plus a couple of other surprises. Renewing early gives us confidence that we will go into the new year with your strong support. If you are not a current member, please consider joining. Not only are you supporting the only broad-based arts organization and gallery in Berkeley County, you are eligible to exhibit your work in the Members’ Exhibit and other benefits. You can join online here. Teaching Artist Judith Becker teaches color theory at the Berkeley Art Works. The Berkeley Arts Council has announced new art classes starting in January, 2016. These classes are taught by popular instructor Judith Becker. Classes are held in the Berkeley Art Works, 116 North Queen Street in Martinsburg. The “Winter Special” workshop series offers four three-hour workshops for the price of two. The four workshops will be held Fridays in January from 1-4pm. They are “Skys and Clouds” on January 8, “Water” on January 15, “Trees and Backgrounds” on January 22, and “Textures” on January 29. Registration for all four workshops is $90, which is half of the normal tuition. Also offered is a new “Beginning Watercolor Painting class” on Saturdays in January from 1-4pm. Two additional classes in February are “Basic Principles of Great Drawing, Composition, and Design” (Fridays, February 5, 12, 19, 26, 1-4pm) and the very popular “Unlocking the Mystery of Color” (Saturdays, February 6, 13, 29, 27, 1-4pm). For details and online registration visit http://artworks.berkeleyartswv.org/instruction/. 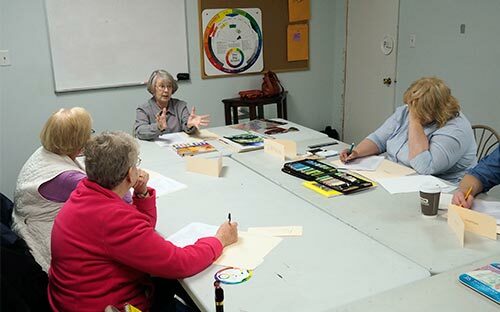 The Berkeley Arts Council is a 501(c)(3) non‐profit organization incorporated in West Virginia working to ensure that Berkeley County has a vibrant, vital arts environment by promoting awareness, understanding and appreciation of the literary, visual and performing arts in the Eastern Panhandle of West Virginia. The Berkeley Arts Council is on the Web at www.berkeleyartswv.org.